On the 2nd (Tue), take in the spiritual surroundings of Santa Maria dei Miracoli, get to know the fascinating history of St. Mark's Square, take in the views from Ponte dei Sospiri, then admire the striking features of Doges' Palace, then contemplate the waterfront views at Canal Grande, and finally admire the landmark architecture of Scala Contarini del Bovolo. To see photos, reviews, maps, and other tourist information, read our Venice itinerary builder. New York City, USA to Venice is an approximately 17.5-hour flight. The time zone difference moving from Eastern Standard Time to Central European Time is 6 hours. In May, daytime highs in Venice are 71°F, while nighttime lows are 56°F. 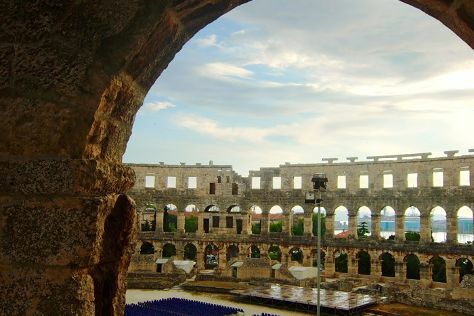 Wrap up your sightseeing on the 3rd (Wed) to allow time to travel to Pula. Kick off your visit on the 3rd (Wed): examine the collection at Istrian de Dignan - Ecomuseum and then delve into the distant past at Pula Arena. On your second day here, appreciate the extensive heritage of STARI GRAD, view the masterpieces at Atelier Sottomuro, and then enjoy the sand and surf at Plomin Luka. For photos, reviews, and tourist information, go to the Pula vacation planner. Getting from Venice to Pula by car takes about 3.5 hours. Traveling from Venice in May, expect a bit cooler with lows of 51°F in Pula. Cap off your sightseeing on the 5th (Fri) early enough to travel to Zadar. Kick off your visit on the 5th (Fri): paddle through the water with a kayaking and canoeing tour and then appreciate the extensive heritage of Narodni trg u Zadru. For more things to do, reviews, traveler tips, and other tourist information, use the Zadar holiday planner. You can do a combination of bus and flight from Pula to Zadar in 3.5 hours. Alternatively, you can do a combination of car and taxi; or take a bus. 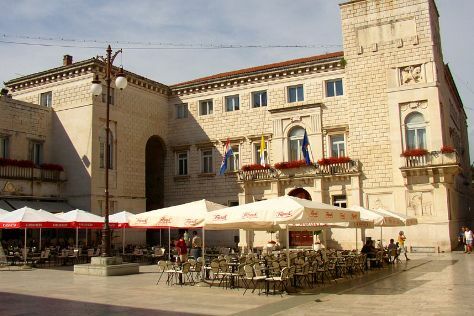 May in Zadar sees daily highs of 73°F and lows of 51°F at night. Cap off your sightseeing on the 6th (Sat) early enough to catcht the bus to Plitvice Lakes National Park. On the 6th (Sat), explore the striking landscape of Plitvice Lakes National Park. Get ready for a full day of sightseeing on the next day: explore the wealth of natural beauty at Cascades and then take in the dramatic scenery at Sastavci. For maps, more things to do, traveler tips, and other tourist information, use the Plitvice Lakes National Park trip planner. You can take a bus from Zadar to Plitvice Lakes National Park in 1.5 hours. Alternatively, you can drive. In May, plan for daily highs up to 73°F, and evening lows to 51°F. Finish your sightseeing early on the 7th (Sun) to allow enough time to drive to Budapest. You'll explore the less-touristy side of things at Buda Castle and Liberty Statue. Satisfy your inner culture vulture at Fisherman's Bastion and House of Terror. There's lots more to do: contemplate the long history of Matthias Church, take in the views from Chain Bridge (Szechenyi lanchid), step into the grandiose world of Vajdahunyad Castle (Vajdahunyadvar), and appreciate the history behind Heroes' Square. To find more things to do, reviews, and more tourist information, refer to the Budapest travel planner. Drive from Plitvice Lakes National Park to Budapest in 6 hours. Alternatively, you can do a combination of bus and shuttle; or take a bus. In May, daytime highs in Budapest are 72°F, while nighttime lows are 50°F. Wrap up your sightseeing on the 11th (Thu) early enough to travel to Prague. Get outdoors at Czech Paradise and Kralovska Obora-Stromovka. Get some cultural insight at Prague Astronomical Clock and Ossuary / The Cemetery Church. 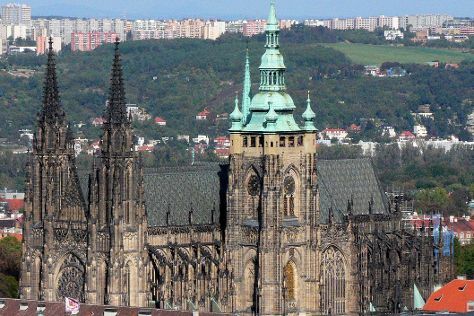 And it doesn't end there: make a trip to Old Town Square, contemplate in the serene atmosphere at Jewish Museum in Prague, pause for some serene contemplation at St. Vitus Cathedral, and look for all kinds of wild species at Devil's Channel. To find maps, where to stay, reviews, and tourist information, use the Prague vacation trip planner. Getting from Budapest to Prague by flight takes about 5 hours. Other options: drive; or take a train. Traveling from Budapest in May, expect nights in Prague to be about the same, around 48°F, while days are a bit cooler, around 63°F. Wrap up your sightseeing on the 14th (Sun) early enough to travel to London. National Gallery and Churchill War Rooms will appeal to museum buffs. Deepen your sense of the past at sights like Tower of London and The Lanes. When in London, make a side trip to see Brighton Beach in Brighton, approximately 1h 35 min away. There's still lots to do: learn more about the world around you at Natural History Museum, take in the architecture and atmosphere at St. Paul's Cathedral, step into the grandiose world of Buckingham Palace, and don't miss a visit to Big Ben. To find ratings, traveler tips, and other tourist information, refer to the London sightseeing planner. You can fly from Prague to London in 5 hours. Other options are to drive; or do a combination of bus and train. The time zone difference when traveling from Prague to London is minus 1 hour. In May, plan for daily highs up to 62°F, and evening lows to 50°F. Wrap up your sightseeing by early afternoon on the 18th (Thu) to allow enough time to travel back home.